Here’s another sock project. I got the idea from the very cool book, Sock and Glove. I love sock projects because there is so little sewing involved, which makes them super fast! This fish took only 10 minutes to make. 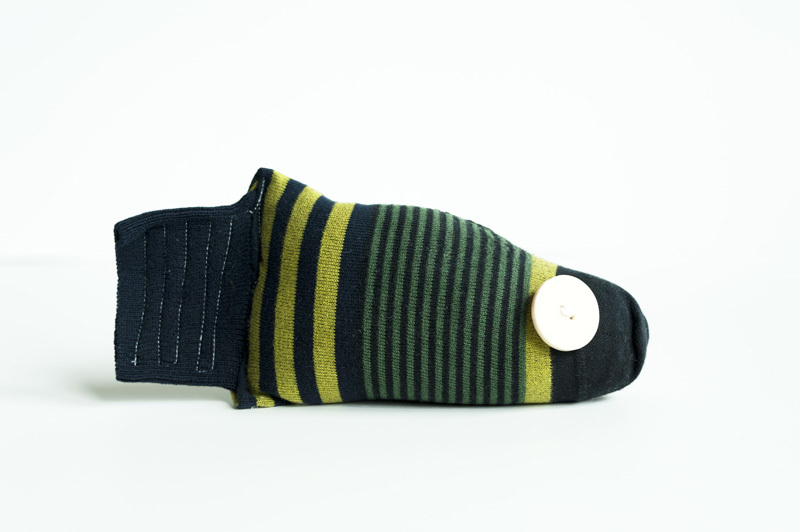 Also, sock crafts are a great way to repurpose my stripy socks so I don’t have to just throw them away. 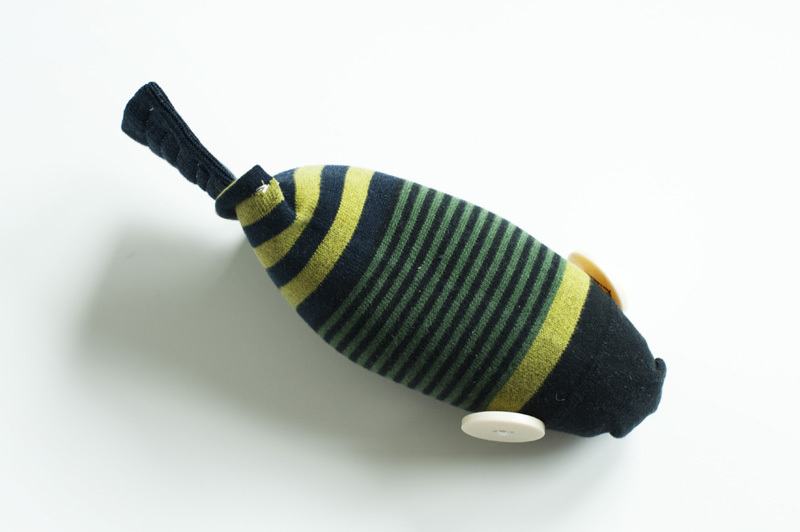 And if you made one with felt eyes, instead of buttons, it could be a great baby toy too! To try making one yourself, just cut your sock across the heal, then fill it with stuffing. Then cut the tail piece off the remaining scrap, and insert it into the open end of the body. Then sew across to secure it. Finally, add your button eyes. I used embroidery thread, so they’re nice an sturdy. That’s it! I keep meaning to cut up my fabric to make fish for my kids. 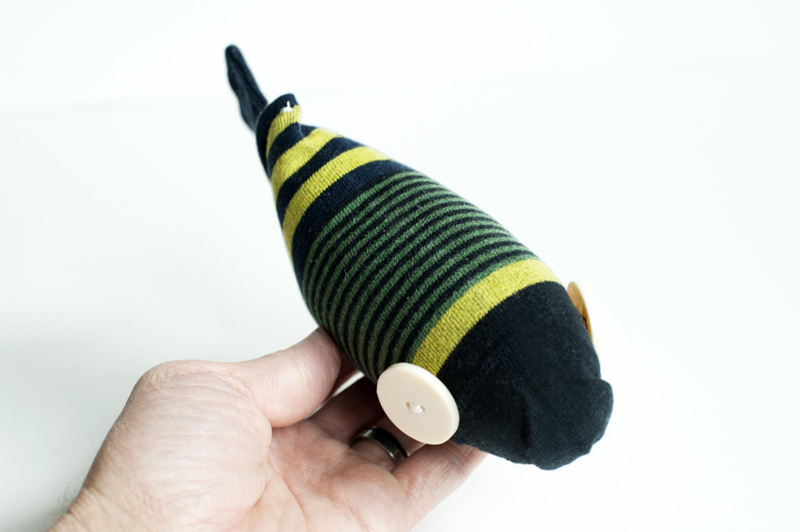 I plan to attach a washer to the mouth and give them a dowel with a magnet so they can fish. I might have to raid the sock drawers instead. Very cute. what an amazing idea, Heather! Maybe I`ll try it here in Spain! Great idea! I've got all these cute baby socks I couldn't figure out what to do with. Now I know what to do with them! Adorable! Maybe if you use metal buttons, they could work for a fishing game, too! Great ideas everyone! Yes, metal buttons or washers, and these could be good for the fishing game. I've got to try that!! What a fish !!! I knew the rabbit with two socks, but it's the first time I see a sock fish thanks ! your socks rock! cool socks make for great creatures. Your idea is brilliant...as usuall : ) but I'm looking on your socks and I have to say it - you have really nice socks!!! I love this, along with everything else I've found on your webpage. But I do hope you made an adjustment to this design before you give it to the baby... I think the buttons could be dangerous to her. Yes, I agree. I already gave it to my son, who is 4. He's really into fish and underwater life now. I'll have to make one for the baby with sewn on felt eyes I think!